This little robot wants to turn your frown upside down. It's enough to melt your stony heart. Gamer meets gamer. Gamers fall in love, decide to break out on their own and form their own development studio to make little game babies together. And so here we have Fenix Fire's 'first born', a rather ebullient side-scrolling platformer that wants, more than anything, to put some sunshine back in your day. Poor awkward teen robot boy Roboto finds himself on a quest to find his lost love, who has inconsiderately blasted off to another galaxy. Cue jump-filled kleptomania! It's not terrifically original, sadly, but rather like Cordy (now available for free on iOS, people! ), Roboto still catches the eye through its class and high-gloss execution. 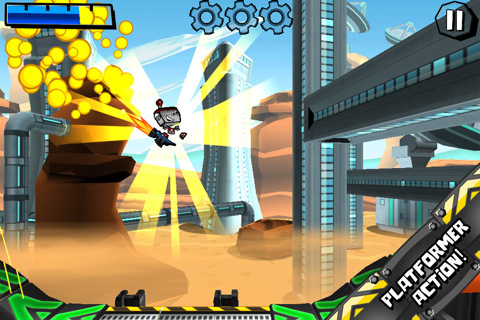 Key to its effervescent charm is the quality level design combined with simple yet flexible controls, and a smooth learning curve to ensure players develop a deft mastery of the twitchy hover-jump mechanics. It also helps if you're a decent shot, too, with increasingly irksome sentries to neutralise en route. By the time Roboto starts facing off against chunky boss monsters, this simple, unpretentious romp starts to show its teeth a little and adds challenge to its cute cartoon sheen. Roboto could have strayed from the well-worn formula a little more than it does, but as a quick platforming snack between meals, this does just fine. Requirements: Compatible with iPhone, iPod touch, and iPad. Requires iOS 4.2 or later. What's Hot: Cute hero, attractive visuals, good in short bursts. What's Not: Controls need work, game not especially deep.